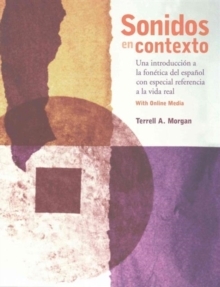 Sonidos en contexto is a comprehensive, theory-independent description of Spanish phonetics and phonology for intermediate to advanced students. It provides articulatory descriptions of native pronunciations, as well as practical advice on producing native-like sounds and a logical progression of exercises leading to that end. What sets this book apart from other phonetics texts is its emphasis on real-world examples of spoken Spanish, using native pronunciation modeled in natural contexts. While other available texts stress phonetic theory, this one provides hands-on activities that are entertaining, culturally framed, and relevant to students' interests and experiences. The book also includes a downloadable instructor's manual, as well as engaging, colorful exercises in the text, photos of realia, and a high quality and very diverse 6-hour audio program, available online.